My first thoughts on this one? Thrillingly unique. Donovan has created a world completely of her own and runs with it. New races and political structures are presented that are so real and well developed that you can’t help but believe in them. I love the background and political information that Donovan works into her brilliant novel. It’s all there and in an informative yet captivating manner. She doesn’t stop the forward flow of the story to provide a narrative, but rather works the details into the storyline itself. Her fact paced and upbeat writing style draws you in while her solid storyline keeps you hooked. Everything combines together to create something that is simultaneously emotional and suspenseful. The characters in this novel were completely off the hook! The main characters were both fully developed individuals that you could easily identify with. I love how they meshed together while still contrasting with and sparking against each other. It was brilliant. And the fact that the male lead has a bit of a paranormal 007 feel to him didn’t hurt either. The supporting cast was also quite intriguing. Each character is developed as a character that could stand alone in their own story. Overall, this novel was exciting and intense. 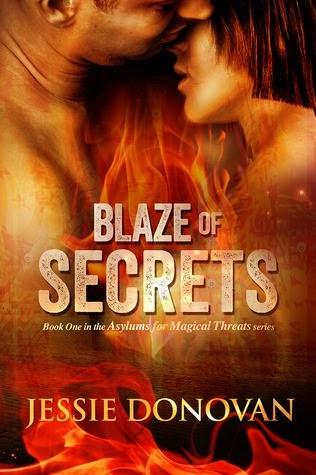 It was a brilliant first novel for Donovan and I can’t wait to read more from this talented author. .
And now, enter to win an ecopy of Blaze of Secrets by Jessie Donovan. mobi, epub, & pdf formats are available. Entries close @ 11:59pm Dec 7/13. The winner will be notified Dec 8/13. The winner will have 72h to claim their prize. First I have to say that I thought I followed you through my email but when I checked discovered I was wrong so am going to become a follower under my other name through google as ladybirdrobi. As to how much do i love shifters well those are the only books I look for and preferably m/f or m/f/m. I love all kinds of shifter and other paranormal romance. Thanks for such a great giveaway. I have been following you by email for some time now, and you have some great reviews. Keep up the good work. I'd be excited to read this book! Thanks for the great giveaway! Shifter books are my goto books to purchase. Of course I read lots others. I am a huge fan of Shifter romances! Anything paranormal I can get my hands on. Thank you for the giveaway! I really love all types of shifter stories, especially with romance. Your book looks awesome! I love shifter romance as well as any other paranormal romance. I love living in this type of fantasy world. I love shifter romance. Thank you for the giveaway. It depends what they're shifting in to! I like unique shifters, not animal-shifters so much. The shifters need to be monsters for me to buy in to it. I look forward to reading this exciting and unique story by Jonel. Thank You! I Love story-lines that are different, not boy meets girl, girl falls for boy, etc, etc, lol! I've read quite a few, Nalini Singh's being my all time favourite series (Psy/Changeling). That's the only kind of romance I like. Thanks for the giveaway! Hmmm.. I like all sorts of genres and this is one of them xD This book totally sounds interesting :) Can't wait to read it. Oh, and thanks for the giveaway! Thank u for this chance. I love all tyoes of book so I would enjoy read a book about shifter romance. Thank you for this giveaway! Blaze of Secrets sounds amazing! !